Christmas is almost here! But before we deck the halls, there are things we need to be mindful of to keep our pets safe this festive season. The team at our Frank Samways Veterinary Clinic share their advice on 12 festive hazards pet owners should be careful of. Theobromine is the toxic ingredient in chocolate (also found in coffee, tea and cocoa powder). Dark chocolate and cocoa powder are the most dangerous, as they contain the most concentrated volumes of Theobromine. Milk chocolate is less dangerous, while white chocolate contains no Theobromine. Symptoms of chocolate toxicity include vomiting, diarrhoea, tremors, salivating, and an increased heart rate. Seek immediate vet attention if you observe any of these signs in your pet. Delayed treatment can result in seizures, cardiac arrhythmias and death. Batteries are extremely dangerous if ingested, as they leak acid into the pet’s oesophagus and stomach. Kinetic sand, if eaten, sits in the gut of the pet and doesn’t move, involving a long and costly surgery to remove it. Christmas decorations can be very appealing to our pets. After all, they look like toys! Cats in particular love to play with tinsel and Christmas tree decorations, but these can cause serious health problems if swallowed. The traditional Aussie BBQ can be dangerous for our four-legged friends, especially dogs. Too much fat or rich meat can cause a painful condition called pancreatitis, where the pancreas becomes inflamed from trying to break down too much fat. Onions and garlic are also dangerous, as they interfere with red blood cells, causing the body to break them down quicker that the dog can make new ones. Cooked bones should also be avoided, as they can splinter in the animal’s mouth. These shards can penetrate the stomach, putting holes in it. Feeding cooked bones can also cause severe constipation. If you enjoy a juicy cob of corn, be sure to put it in the bin once you’re finished. Cobs are a common cause of blockages in the stomach of dogs and must be surgically removed. 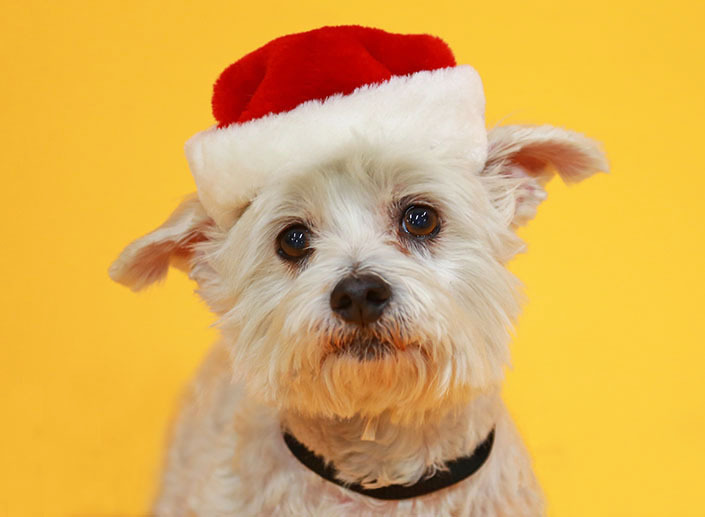 Holly, mistletoe, poinsettia and lilies may be beautiful, but they’re very toxic to our pets. Effects vary from plant to plant and some symptoms may take a while to show. Cats that eat lilies can have ulcers in their mouth and develop damaged kidneys, which can lead to renal failure. Keep cut flowers and pot plants out of pets’ reach, or avoid placing them in the house. Something that can’t be avoided when unwrapping presents at Christmas is the rubbish! Keep pets away from the unwrapping of gifts and be sure to clean up thoroughly, otherwise your pet may ingest something dangerous. Alcohol should never be given to pets. Hops, an ingredient in beer and the grapes that make wine, are toxic to dogs. Raisins, sultanas and grapes damage a dog’s kidneys, causing renal failure. Macadamia nuts can cause vomiting, muscle weakness, muscle tremors, fever and depression. Common human medications, such as Panadol (paracetamol) and Nurofen (ibuprofen), are toxic to both cats and dogs and cause liver and kidney damage. Cats are particularly sensitive to paracetamol and even a small amount can be disastrous. Other medications that can be dangerous are anti-depressants, sleeping tablets and the contraceptive pill. Make sure all medication is put away and out of your pet’s reach. With new bikes turning up, gardening being done and Christmas trees being put back into storage for another year, garages and sheds are a hive of activity. Make sure snail and rat baits are stored safely, as well as engine oils and radiator fluids. Artificial sweeteners are common in many food products, such as chewing gum and some peanut butters. When dogs eat this, it causes their blood sugar level to drop dramatically, which can lead to a coma and death. When the weather heats up, we need to be mindful of our furry friends. Remember not to walk or run with your dog in the heat of the day, especially if they are overweight or brachycephalic (have a squishy face). Never leave pets in cars on warm days. Cars can reach the same temperature as an oven within minutes and be fatal for pets. Make sure there is lots of shade in the yard and access to more than one source of water. Cats are pretty good at finding a nice cool spot, but you may want to consider having long-haired cats’ tummies shaved so they can cool themselves down. 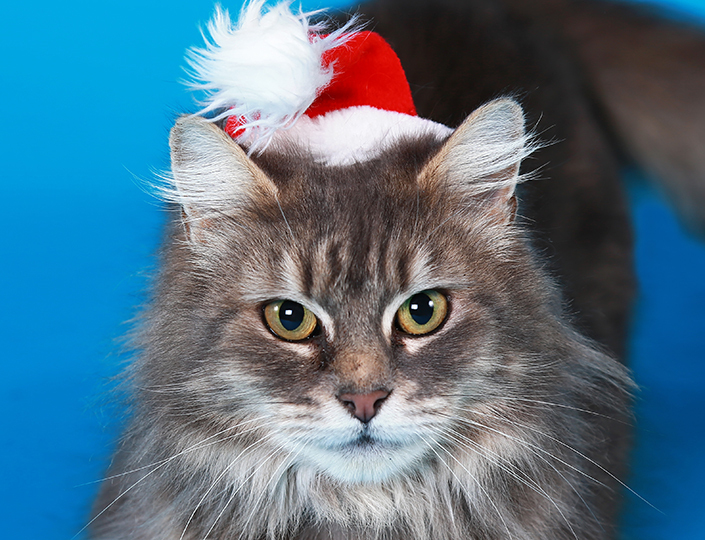 Dr Trepheena Hunter, Animal Behaviour Manager at the Home, shares advice on keeping pets happy and relaxed during Christmas celebrations. Make sure your pet can always get away from the crowd if they need a break. Provide a ‘safe place’, such as a crate, mat or room, where your pet can retreat. When your pet is in their ‘safe place’, make sure nobody disturbs them. Before the guests arrive, assign one family member to be in charge of keeping an eye on your pet and making sure they are relaxed. Remember that even if your pet is usually great with visitors, Christmas can be particularly loud, busy and overwhelming. If you have children visiting, make sure there is always an adult supervising, even if your pet is usually fine with children. If your pet shows any signs of stress or discomfort, take them away from the guests. If your pet gets worried about loud noises, consider putting them in a quiet part of the house before you open Christmas crackers or play noisy games. Christmas day can involve lots of movement inside and outside. If you’re not able to keep an eye on your pet to make sure they don’t get out by mistake, consider putting them in another room inside, such as a laundry, with some tasty treats to enjoy. If your pet has ever shown aggression over food or toys, be sure to remove all of the toys and treats before your guests arrive, or put your pet in a quiet room on their own. If you need to confine your pet away from guests during the day, make sure they have lots of fun things to do, such as treat dispensing toys, chew treats and other toys, as well as a comfortable bed and plenty of water. Your pet will feel happier if they can get to their favourite place – their ‘safe place’ – while you’re away. This may be a bed, mat, room or crate. Leave plenty of fun things for your pet to do while you’re away, such as food dispensing toys, and their favourite toys. Also leave plenty of water. Christmas day can be noisy with parties and sometimes fireworks, so if your pet is worried about loud noises, make sure they are somewhere safe. If possible, consider leaving your pet inside with a radio playing quietly. If your pet doesn’t like being left alone or is worried about noises, consider setting up a monitoring system so you can make sure your pet is relaxed and safe at home. There are various apps that allow you to set up a webcam at home and check in on your pet regularly. If you have questions or concerns about your pet’s health or well-being, you can make an appointment at the Frank Samways Veterinary Clinic by calling (03) 9329 2755. Christmas and New Year opening hours can be found here.